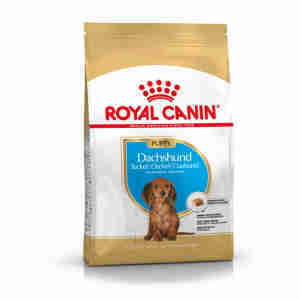 Royal Canin Dachshund Puppy is a complete dog feed specially formulated for Dachshund puppies up to 10 months old. With joint and bone support thanks to an adapted calcium and phosphorus content. This exclusive formula also helps maintain ideal weight. DIGESTIVE HEALTH - This formula contributes to supporting digestive health and promoting a balance in the intestinal flora. NATURAL DEFENCES - This formula helps support the Dachshund puppy’s natural defences. EXCLUSIVE KIBBLE : DENTAL HEALTH - This formula helps reduce tartar formation thanks to calcium chelators. COMPOSITION: dehydrated poultry protein, rice, maize, vegetable protein isolate*,animal fats, beet pulp,hydrolysed animal proteins,minerals, soya oil, fish oil, fructo-oligo-saccharides, hydrolysed yeast (source of manno-oligo saccharides),marigold extract (source of lutein), hydrolysed crustaceans (source of glucosamine),hydrolysed cartilage (source of chondroitin). ADDITIVES (per kg): Nutritional additives: Vitamin A: 27200 IU, Vitamin D3: 700 IU, E1 (Iron): 50 mg, E2(Iodine):5 mg, E4 (Copper): 10 mg, E5 (Manganese): 65 mg, E6 (Zinc): 194 mg,E8 (Selenium): 0.11 mg - Technological additives: Pentasodium triphosphate:3.5 g -Preservatives - Antioxidants. ANALYTICAL CONSTITUENTS: Protein: 30% - Fat content: 16% - Crude ash: 6.9% -Crude fibres: 1.5% - Per kg: Calcium:12 g -Phosphorus: 8.8 g. *L.I.P. : protein selected for its very high assimilation. Perfect for our young dog. It's helping her grow and develop really well.